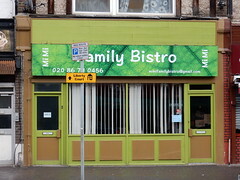 Polish restaurant and bar in Norbury. The decor is understated, with pale brown walls adorned only by a flatscreen and long mirror, large grey tiles on the floor, dark wood style melamine-topped tables, and upright chairs swathed in black fabric covers. A single tulip on each table adds a subtle touch of colour. At the back is a small bar, stocked with spirits and beers. There's seating for around 35 people, with plenty of space between the tables. Kake visited on a Friday afternoon in March 2019. There was just one other customer when I arrived a little before 2:30pm. Music videos were playing on the flatscreen, with the sound on, not too loud. I went for the pierogi ruskie z cebulka i kwaśna śmietana (Russian dumplings with onion and sour cream; £8.50) photo. They took a while to come, but were worth the wait. They were clearly hand made, with slight differences in size, and had been cooked perfectly al dente, with just enough bite left in the dough. The filling of potato, cabbage, and soft cheese was nicely blended and had a decent flavour. The well-fried onions on top and small bowl of sour cream on the side added enough interest that I didn't get bored of eating them, despite the generous portion. My only criticism would be that there was just a little too much of the onion oil included for my preference. Note that as of March 2019 it's cash-only. Kake's verdict: I'd like to come back and try more of the menu; their duck dumplings and home-made smoked trout both sound interesting. Accessibility: A ridge at the threshold, but no step. Also no steps inside, including to the unisex toilet. Last edited 2019-04-14 10:15:50 (version 2; diff). List all versions. Page last edited 2019-04-14 10:15:50 (version 2).